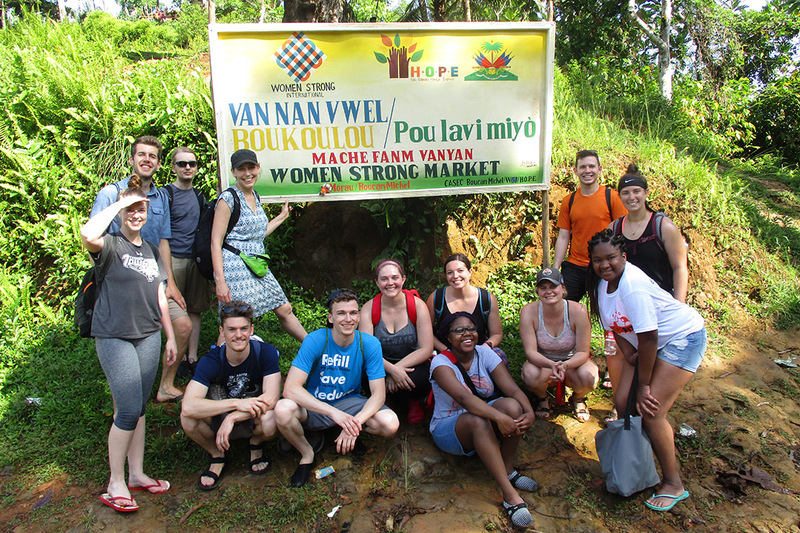 RIT students traveled to Haiti as part of a pilot course, Social Impact Field Experience in Haiti, and worked alongside women from SEE Fanm, a nonprofit leadership group, on potential business projects. The students were part of the class Social Impact Field Experience in Haiti. The pilot course was designed to match students at RIT with partners from a Haitian nonprofit called SEE Fanm—Sante (Health), Edikasyon (Education), Ekonomi (Economy) for Fanm (Women)—to establish sustainable business products and services, primarily in health care and education. Both groups would come to understand that culture rather than technology is one of the biggest factors in building products—and working relationships, said Sarah Brownell, RIT faculty member and one of the course co-developers. “The course was a response to the question: How can we connect research and projects such as those in the senior design program with real-world projects that can actually change people’s lives and help them sustain themselves?” said Brownell. She and Rob Stevens, both faculty members in RIT’s Kate Gleason College of Engineering, led the travel to Haiti. Businesses that may work in a U.S. city may not work in the rural communities of Haiti or other developing countries. But being able to assess a community’s resources, experience and needs could mean business options that thrive. “We wanted to find a way to involve students and work with a local community so that they are involved in the design and decision-making process,” said Stevens. Both he and Brownell developed the course as a way to widen students’ understanding of how new products and services might be created, especially in developing countries. Half of the course was spent understanding the theory of human-centered design—problem solving with the human perspective at the forefront. They also studied the language and culture to better understand political, economic and societal issues in the country. In Haiti the teams would identify general project ideas together in the areas of food preservation, using locally-sourced ingredients for cosmetics, increasing educational access and finding waste reduction solutions in transporting products to and from the marketplace. Both Stevens and Brownell have experience living and traveling in Haiti. Stevens, an associate professor, has led multiple projects as part of the Environmental Protection Agency’s (EPA) People, Prosperity and the Planet Student Design Competition, with teams recognized for alternatives to charcoal cook stoves using thermoelectrics to reduce fuel consumption and improve air quality. Soon after graduating from RIT in 1998, Brownell began what was to become a major part of her volunteer commitment to Haiti, working with the organization Haiti Outreach: Pwoje Espwa (HOPE) on installing solar power for a clinic and water disinfection systems for a local community. She co-founded SOIL—Sustainable Organic Integrated Livelihoods in 2006 as an ecological sanitation social enterprise nonprofit in Haiti. While teaching at RIT, she and Brian Thorn, professor of industrial and systems engineering, led student groups as part of the class Engineering for the Developed World, and an EPA project to develop an arborloo (a modified latrine) to promote sanitation in rural environments is being tested in Haiti today. What the students planned for and what actually occurred was eye-opening. The college of engineering provides a variety of experiential learning options starting with its extensive co-ops, Honors Program, Travel Abroad and senior design projects that connect students with local, regional and now, international project options. The college also partners with RIT’s College of Liberal Arts in the National Academy of Engineering Grand Challenges Program. Note: Several students are continuing to work with the SEE Fanm women on four of the projects started during the pilot course. The faculty members expect to present a similar course in an upcoming semester and are interested in collaborating on projects with other interested students and faculty. Plans for funding support are also underway to ensure that the program is sustaining.